The Bewildered 20-Something Writer has nominated me for the Liebster Award! 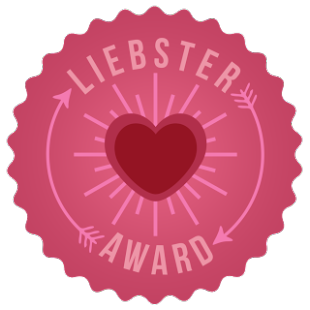 What is the Liebster Award, you may be wondering? It’s an award for smaller blogs that other bloggers think are pretty great — thank you, Bewildered. According to The Bewildered 20-Something Writer, Liebster means “dearest” in English. Blogs are nominated for the award by other bloggers in hopes the award will draw more traffic to the nominated blog, and that it would get more views. If a blogger accepts the nomination for the Liebster Award, he/she answers ten questions posed by the nominating blogger, and then nominates other blogs for the award in the same way. 1. Who/What is your favorite storybook character? 2. Why do you write a blog? 3. If you could interview any famous/notorious person, past or present, whom would it be and why? 6. What cartoon character are you most like? 7, What do you like to do when you’re home alone? 8. Have you ever danced in the rain? 9. What advice would you give your thirteen-year-old self? 10. What one thing do you most want to accomplish before your life is through? I have been writing stories since I was in the fifth grade simply because I enjoyed writing. My seventh grade English teacher encouraged me to keep writing. This is actually my third blog. I was inspired to begin my first blog (which no longer exists) because some ladies at the church I am a part of introduced me to blogging. This blog was a place I shared about what we as a family were doing and my thoughts and views on different topics. Then I created a homeschool blog to post things my boys and I were doing in our homeschool and to offer tips and advice to other homeschool parents. This blog is still in existence at here, although I rarely post on it anymore. Finally, I began this blog because I was inspired by Jeff Goins, Writer, when I read an e-book he had written about writing that inspired me to start writing again, and to try to do so regularly. If you could shrink any animal – real or mythical – so that it was pocket sized, what animal would you shrink and keep as a pet? I am an animal lover, so this question was difficult, but I think I would have to say an elephant. Name three guilty pleasure books and/or movies that you’re sorry you’re not sorry you like? I would have to say the book The Help by Kathryn Stockett, the movie P.S. I Love You, and the book A Knight in Shining Armor by Jude Deveraux. I suppose it would be Isabella. What inspires you creatively, i.e. what gets your creative juices pumping again when you’re in a bit of a slump? Going to the mall and simply people watching and catching bits and pieces of the conversations that go on around me. mean to me, and spend some time in prayer. Name the weirdest/funniest/coolest/most memorable etc. dream you’ve had. What advice would you give your six year old self? 1. Spending time with my husband and three sons. Kelly, thank you for nominating me. I finally got the post up for the award. You can review it at http://speculationsimpressed.wordpress.com/2013/10/19/nominated-for-the-liebster-award/.